The structural shape of the compartment car goes back to the beginnings of the railway history. 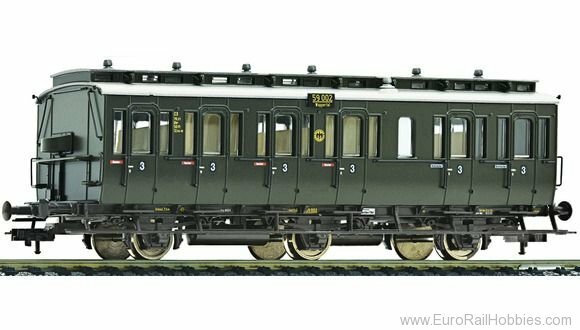 The type „pr 11“ is one of the last built Prussian compartment cars with skylight roof and at the same time one of the most built passenger wagons in the German area. The three or two axle wagons were availabe with and without brakeman''s cab. A few units can still be seen today on tracks of railway museums. The completely new construction compels through its seperately mounted parts such are e.g. the handrails and the finest multi-colour inscriptions and its semi-matt livery.